Ok, now onto a little bit of painting goodness. This past week I finished up two pieces using the same color scheme. I find myself doing this often - using the same color for multiple pieces in a row. Maybe it's because I'm too lazy to clean my brushes, and it's just easier to keep on going with the same color. And yes, for the record, I have a whole graveyard of dried paint-hardened brushes that never made it's way to the sink for a good cleaning. Regardless what the reason may be, although the dressers are painted in the same colors, the end results look quite different. The color combo: Annie Sloan Chalk Paint in French Linen and Old Ochre. The first piece is a Victorian styled four drawer dresser. I forgot to take a Before shot of it, but I think you can get the gist of how it started...dark wood, some scratches and dings, in need of some love, but overall structurally sound. Also, it did have all four original casters in tact still which was a bonus. Here is how the piece turned out. I have used this color combination before, but never in this style. (You can see a past piece with this combo here). When deciding how I was going to paint this dresser, I tried to apply some of the methods I saw at the French Flea Market. 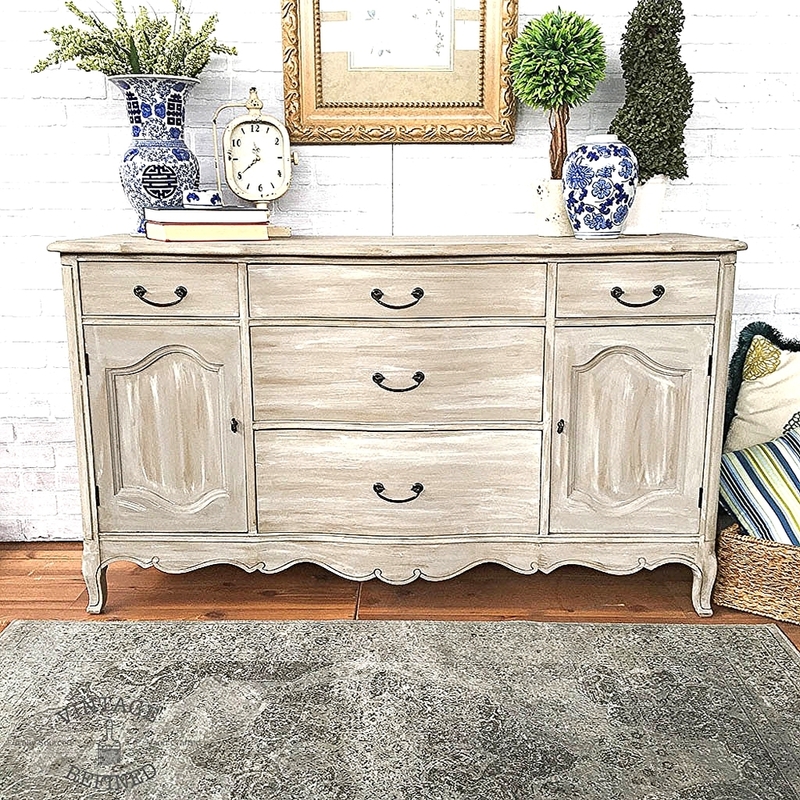 The goal is to achieve a piece that looks like it's hand painted and time worn... and not some manufactured junk from a factory in China. So, trying to get every brush stroke perfect wasn't my objective. I really played with texture and distressing on this piece. I love this color combination, as it is neutral and versatile without screaming 'blah'. The hardware and stained top give it extra contrast. For the top, I stained it with a coat of Special Walnut by Minwax. I then used Weathered Oak for the second coat which helped to tone the color down a bit. So there you have it, subject one. Onto the next piece. Here is a Before shot. For this piece, I started by painting two coats of French Linen over the entire buffet. At this point, I wasn't exactly sure what I wanted to do next, so I just started experimenting. I first went dark by applying both the clear and dark wax to the buffet. It looked all right, but I wasn't really feeling it 100%. So, I decided to then go light. (This is starting to sound a lot like my hair color routine.) To freshen it up, I used the wash technique with Old Ochre. Because I did this after the wax, it was easier to manage as it didn't soak right in. The overall effect reminds me a bit of a distressed wood look. By incorporating in the dark wax, the buffet now has a bit of a brown undertone. However, I think the light streaks help to balance it out. To minimize the French Provincial feel, I updated the hardware. These pulls are from D. Lawless Hardware. They actually came in brass, but I sprayed a coat of oil rubbed bronze over them to achieve the finish I was going for. I love makeovers like this one where you just kinda go with the flow and see where the creativity takes you. This was definitely one of those makeovers where I cranked my iPod way up, tuned out the rest of the world, and lost track of time...anxious to see how the piece would turn out. Similar to the dresser above, I think this piece finds a balance of being neutral yet not bland. So there you have it. Two furniture makeovers. Two colors. Two very different styles.